Mill+ was excited to join forces with McCann Canada to introduce Mastercard's Priceless Cities + Apple Music collaboration. In order to illustrate this collaboration, The Mill set out to use sound waves to visualize Toronto's skyline and bring the city to life through music and animation. 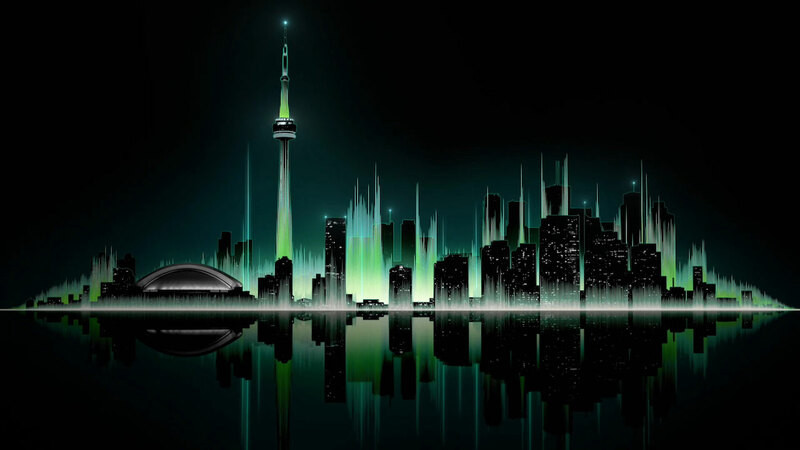 Director, Thomas Heckel comments, "The challenge was to use the skyline of Toronto reimagined as as sound waves or equalizers using color and reflection. The standard design of a sound waves is very technical and frenetic. I had to find a gracious way to fuse the sound waves with the cities; to recreate the dance of the sound waves and align these waves to each building in order to feel the graphic was revealing the city". Each concept was carefully curated with both print and animation in mind. In order to maintain the natural ambiance and style of the darker environment, Heckel wanted to emphasize the glowing neon feel. "To avoid the frenetic movement of the sound waves I transformed them into EKG lines. The horizon line then became the heart beat of the city. This idea relies on representative waveform visuals that appear to be within the city itself. Peaks and valleys of colorful light exist behind the buildings in the foreground, as if the sound wave is rising from the heart of the city."